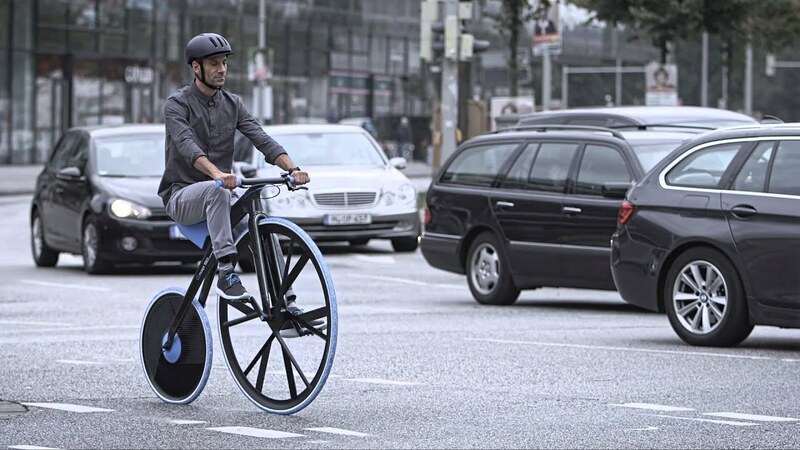 With the design study Concept 1865, we obviously do not re-invent the bicycle. The e-bike is rather a thought experiment that illustrates the extraordinary applications of modern plastics. Conspicuous with its wheels of different sizes, the velocipede was the first pedal-powered cycle in history. BASF has now rebuilt the 19th century bike – as a modern e-bike with plastics from the BASF product range. A link between past and future: The e-velocipede shows what the historical pedal cycle of the 19th century would have looked like using today's advanced materials. Under the slogan “Rethinking Materials” together with DING3000 design studio we have developed a ready-to-ride prototype that is made of 24 innovative materials from our product portfolio. The e-bike is made almost entirely of plastics. Only its brakes, axles, and motor are still made of metal. Concept 1865 is a tangible example of the extraordinary and manifold applications of modern plastics – and an invitation to you to promote innovative product ideas together with us. We have plenty of experience here. Since our foundation in 1865, we have been researching new chemical products and helping customers from nearly all industries to put their ideas successfully into practice. As a long-standing manufacturer of raw materials with a global presence BASF is very well informed, particularly when it comes to using plastic. The challenges of creating products with plastic are manifold: from determining the colors and surface finishes right through to optimizing the design and choice of material. The first BASF point of contact for design in plastic are the industrial designers from the designfabrik®. As with this concept the industrial designers from the designfabrik give support in the very early stage of a product development. So they bridge the gap between between the creative ideas of the designers and the possibilities but also the limits of plastic. Travel back into time with Concept 1865 – back to the year 1865, when BASF was founded. This was also the time when the wooden “Dandy Horse” invented by Karl Drais was given its first pedals, and as velocipede launched the bicycle on the road to global success. As a tribute to this era of enthusiasm for technology and invention, together with DING3000 design studio we have developed a velocipede with today’s state-of-the-art technology. See for yourself! Concept 1865 is made of 24 innovative materials from our product portfolio – materials that are sure to come to the fore as electromobility advances. Both high-performance plastics and specialty foams as well as polyurethane materials are used in the velocipede of the 21st century. Discover the materials! The seat of the Concept 1865 is detachable and contains the battery for the electric drive. The vehicle’s silhouette remains sleek. Integrated LEDs concealed in the forks and inlaid optical waveguides render conventional lighting systems superfluous. The ready-to-ride prototype Concept 1865 with an electric drive is made almost entirely of modern BASF plastics, utilizing a total of 24 materials from the BASF portfolio. Only the brake, axles and motor are still made of metal.